Aliases: "The Widow-Maker", "The Soul-Thief", "The Pain-Broker"
Powers: Razorhead had retractable razorsharp claws and horns. He had a titanium-laced exoskeleton and concrete plates for skin, which served to give him superhuman durability and resistance to injury. He could also shapeshift to some degree, as he had been able to extend his limbs and cause them to take a tentacle-like form. 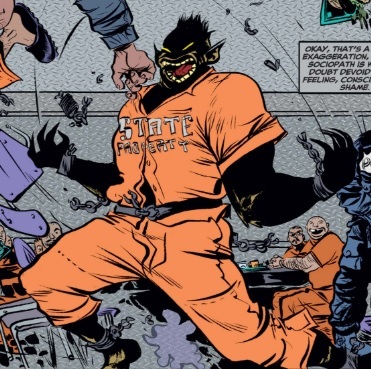 (X-Statix#5)- Razorhead broke out of prison and X-Statix was called in to stop his rampage. He slashed the Anarchist, chopped Dead Girl in half, punched Vivisector in the face, and uppercut the Orphan. His rampage was cut short by Arnie Lundberg AKA the Mysterious Fanboy, who blew off the right side of his body, using his powers of reality manipulation. (Cable and the X-Force#6) - Razorhead was still imprisoned at the Raft. (Uncanny X-Men III#23) - After the Phoenix Five had undone the Scarlet Witch's "no more mutants" spell and mutants started to reappear on Earth, Madripoor became somewhat of a mutant utopia. Razorhead, like so many of his kind, traveled to the island state to make a new life for himself. Comments: Created by Peter Milligan and Paul Pope. Razorhead had escaped from prison and was then killed. While it is possible he is still alive, since he had escaped from prison, Runciter made a mistake in listing him. She had either forgotten his escape or meant someone else, like Razor Cut. Still no explanation for his survival, but maybe after Mysterious Fan Boy blew Razorhead's head off, he altered reality such that Razorhead never escaped in the first place. I realize it might be tough to work that in before the heart attack and all.